Ministry of agriculture estimated harvest 2014 could reach 46.40 million hectoliters, an increase of 9.5% relative to last year. Despite hail damage in the Medoc in 1500 hectares, the yield potential is 50% higher than the very low harvest in 2013. Precocity, a slightly smaller harvest and good growth of the vine leaves let hope for a good vintage. 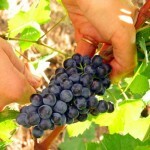 The 1st harvest is expected to begin around September 10th for whites grapes and September 20th for the reds grapes.